The fever for ICC Cricket World Cup 2015 has just begun, which will be held from 14 February to 29 March. A total of 49 ODI matches will be played between 14 countries from around the world. The mega tournament is being jointly hosted by Australia and New Zealand. The final match will take place at the Melbourne Cricket Ground in Australia. The International Cricket Council has sold the rights for broadcasting Cricket World Cup 2015 to ESPN and Star Sports. ICC has declared a total prize money of $10 million for the tournament, which is 20 percent more than CWC 2011. Sachin Tendulkar has been named as the brand Ambassador for 2015 Cricket World Cup by the ICC for the second time, after 2011 Cricket World Cup. To view Cricket World Cup 2015 Fixtures, visit here. Cricket fans can watch the Cricket World Cup 2015 on Television, broadcasted officially by Star Sports in India. 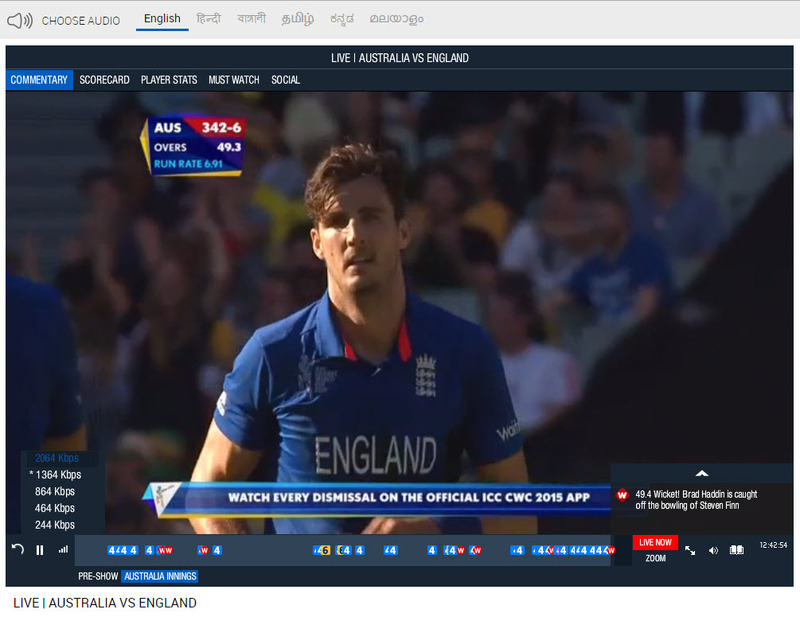 However, if you don’t have a TV and want to catch up the World Cup online via Internet, then you can watch CWC 2015 live streaming in high quality on StarSports.com for free. The live webcast for CWC 2015 is available in English, Hindi and 4 other regional languages. Besides the live video, users can catch world cup through Live Scores and Live Audio on Star Sports site. The live stream can be watched in different resolutions of upto 2064 kbps and in full-screen mode too. Along with live video, users can watch pre-show, former innings, view commentary card, scorecard, player stats, etc. The match highlights clips are also available to watch on starsports.com.